Are you looking for Bengali Mathematics pdf book for Competitive Examination? Then, here is the best place for you. You can download all type of Study Materials Download for Competitive examination like, ssc,wbssc,wbcs,bank, upsc,rail, police, primary, school service, clerk group d etc. Mathematics is the most important subjects to any kind of Competitive Examination. So you should practice daily on Mathematics subjects and know about Shortcut methods. 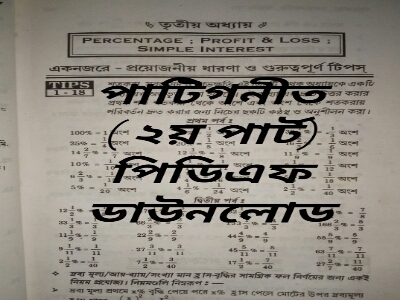 Today, GK Solve share important Arithmetic Bengali pdf book 2nd part for you.Details of pdf book and the download link are given below. You can download this pdf book just one a click and free of cost. Readers are requested, if you help from this blog, please share blog link to your friend's circle. Name Arithmetic (2nd Part) Bengali PDF Book. Disclaimer: GK Solve is not an owner of this pdf book content.GK Solve highly recommends you to buy the original book. This is for, who not able to buy the book.